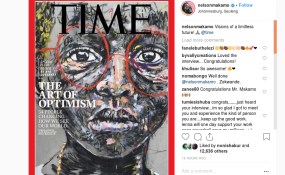 Johannesburg — TIME magazine on Thursday showed off the cover for their 2019 "optimists issue" - a beautiful portrait painted by South African artist, Nelson Makamo. The piece, titled "Visions of a limitless future", is the first magazine cover that Nelson has ever produced. "He was eager to create an image that would introduce his work to the world," an article on TIME explains. The oil painting is one of a child wearing red circular glasses, and according to the site, Nelson had spent a few months on the piece to make sure it was absolutely perfect. This is TIME's second issue devoted to optimism. The issue focuses on "34 people changing how we see our world."